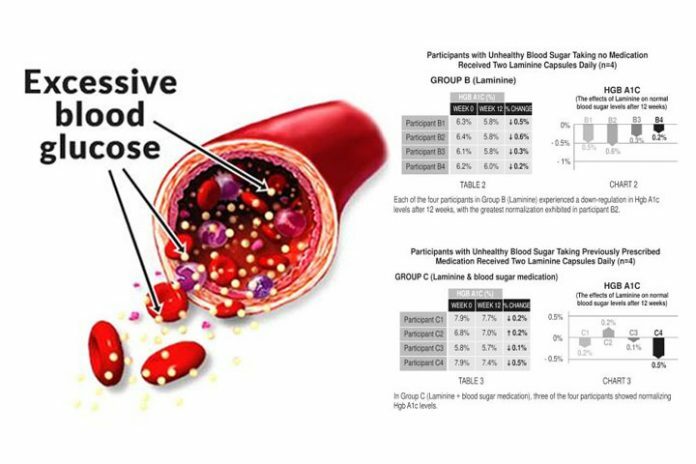 A pilot study was undertaken to see the effects of Laminine in normalizing blood sugar levels, for participants beginning to experience unhealthy blood sugar levels or prediabetic stage. Subjects’ Hgb A1c were assessed at the beginning of the study and after 12 weeks of taking two supplements daily. Three subjects took a placebo, four subjects with slightly higher than normal Hgb A1c levels took two Laminine daily. Four subjects who were on blood sugar lowering medications that had been previously prescribed for them took two Laminine daily. What does it mean for Pre-Diabetes patients? Glucose tolerance breaks down when metabolism begins to be inefficient. Sedentary lifestyles that result in an overweight usually indicates higher than normal glucose levels, though not classified as diabetic or in some cases prediabetic. Although the sample size was not big, the research shows a difference between glucose levels before and after 12 weeks of supplementation with Laminine. The difference in the Hgb A1c marker measurements before and after supplementation (a change of 0.475 units) was also statistically significant in Group B, adding additional credence of the noted effect. This means that taking Laminine may provide the possibility in helping maintain normal blood glucose, particularly in patients getting older and at risk of developing high blood glucose. The Fertilized Avian Egg Extract (FAEE) in Laminine is the highest and purest form of young tissue extract or YTE. It is not denatured with heat thus enables it to retain the Fibroblast Growth Factor (FGF) that triggers stem cells in the body. The FGF2 in Laminine or growth factors react with receptor sites on somatic cells or stem cells, this activity could support glucose absorption. Laminine also contains fish and vegetable protein, which may have an effect on glucose tolerance when added to the diet continuously. Source: J.B. Spalding, Ph. D.